For years, OS X has followed the nomenclature set forward by Steve Jobs, of naming OS X releases after different felines. Well, they were starting to run out of really cool-sounding cats, so they’re going on a decidedly different tack now with Mac OS X 10.9. Finder tabs: Users are accustomed to working with different Finder windows, but they can now merge them all into a single window with tabs. Tagging documents: When saving docs, users can also save tags for them. Tags appear in the Finder sidebar, making high priority items easier to find. Better multiple display support: Now menus and docks are accessible from all displays, mission control has been optimized for all of the spaces, and going fullscreen in one now doesn’t mess with settings on the other. Better battery life: Mavericks has been optimized to radically reduce CPU activity (a rather nifty feature that should work well with those splashy Intel Haswell chips). Compressed memory: Forget memory leak, this feature kicks in exactly when apps need it, with heightened responsiveness under load, 5x improved speed waking system from sleep and more. Safari: The browser has been revamped to boost responsiveness, improved scrolling, “app nap” (a new feature that shifts buried windows into lower priority, to preserve power consumption), one-click bookmarking, a seamlessly scrolling reading list, sidebar for easier bookmark browsing, shared links via twitter/linkedin, and less memory impact. iCloud keychain: Always encrypted, the iCloud keychain can sync across all Apple devices, and can even auto-suggest secure passwords. Notifications: Users can sign up to receive iOS app push notifications on the Mac. When the machine is woken from sleep, it can show every notification that was missed, and will even updates apps in the background. Calendar: The company said, “No cows were harmed” in creating this user interface. That’s a nod to the leather-stitched design that has been tossed out now, for a sleeker more modern look. When creating iCal appointments, the application offers location mapping, travel time and weather, based on the data that was typed in. And travel time is factored into the appointment time. Reminders/notifications for appointments show up on Mac & iOS devices. 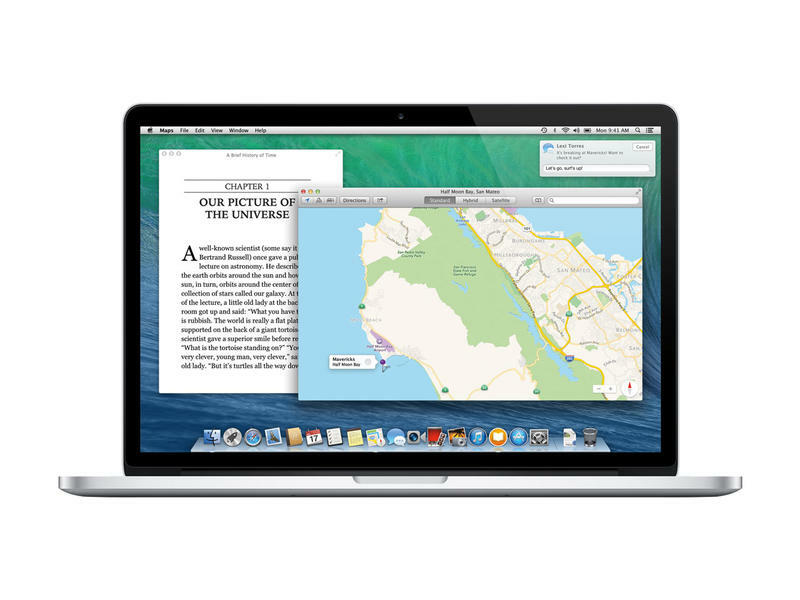 Maps: There’s a new maps app for OS X, and it works just like iOS’ Maps app. Once you set up directions on your computer, you can send that straight to your iPhone. (When you unlock your device, the maps apps is right there.) It includes flyover data, points of interest data, info-cards with reviews and pics, and the ability to add sites to bookmarks. iBooks: The new iBooks Mac application offers access to the full library of 1.8 million books in the book store. You can read and take notes, and it supports interactive iBooks textbooks, so students can study cards that pull in their notes and more. The developer preview of Mavericks is available today, and the final release is coming this fall. Seems like Apple has been peeking into user forums, zeroing in on some of the irritations that people face, and it put a concerted effort into addressing some of them. Optimally, the company wants people using all of its products, and some serious thought has been put into interoperability and cross-syncing. But even people who decline the iOS experience will still benefit from major improvements to battery life and performance. What do you think of OS X 10.9 so far? Let us know if you’re planning to snag this update in the comments.